“The ancient European sailors who passed through the Coromandel Coast of the Bay of Bengal have left some remarks about seven glorious “Pagodas” standing high against the Coastline. The “Pagodas” or temples were visible from far out in the sea as their golden Shikhara(the tower) glittered in the blazing sun. Europeans called this land mark as “the land of seven Pagodas”. In later centuries, the ocean encroached to the Coast; all the Pagodas except one were buried under the deep sea. The seventh Pagoda that survived the ocean is still standing at Mahabalipuram and it is known as the Shore Temple.” - Thus goes the celebrated myth about the seven Pagodas of Mahabalipuram. It is a subject of immense interest of archaeologists and history buffs to determine if the six lost temples had actually existed. Shore Temple - Last one of the seven Pagodas? This glittery story attached to the Shore temple is one thing that attracts flocks of tourist towards the eastern cost of Mahabalipuram. When I first saw the towers of the shore temple from a distance, I couldn’t help but think about this story. 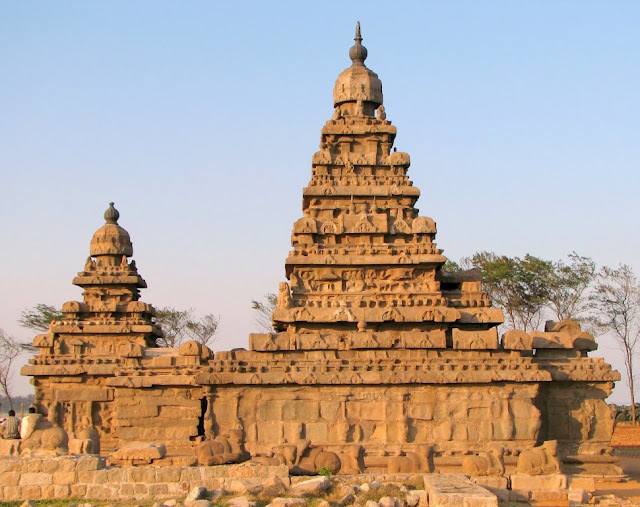 Myths apart, the “Shore temple” that currently exists in the Mahabalipuram Coast was built by Rajasimha Narasimhavarman II during 700–728 AD. 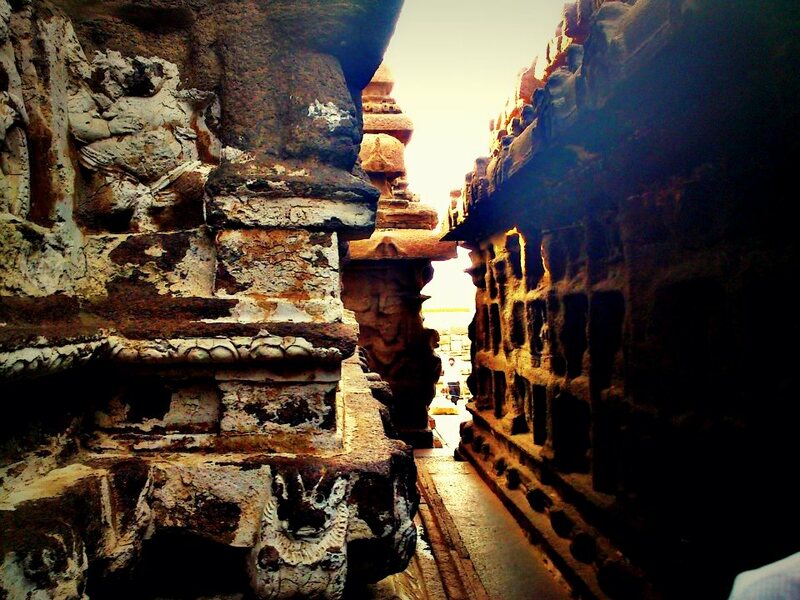 The shore temple has two Shiva shrines and a Vishnu shrine between them. Both the Shiva shrines has multi story Vimana (towers) and the Vishnu shrine has a flat roof. Some researchers believe that the Vishnu shrine was the first one to be built and it too might have had a Vimana but later destroyed. The west facing Shiva shrines is a little smaller than the east facing one. We entered to the larger Shiva shine which, according to the ancient inscriptions named as “Kshatriya Simheswaram”. This shrine is faced towards east at the ocean. There is a lamp pole in front of this temple and it once stood in the ocean! This shows how the coast line changes its contours. May after a few generations, the shore temple itself would be under water! The sanctum (Garbha-gruha) of the first shine has a Shiva Lingam and a Somaskadha panel inside. The Somaskadha panel features Shiva and Uma with their toddler son Skanda in between them. This panel is heavily corroded due to the salty winds from the ocean. There are a lot of sculptures in the interior walls of the temple. Unfortunately most of the sculptures are unrecognizable. The location on the sea shore must have taken a heavy toll on the temple. I recently read that the archaeological department has taken many steps to prevent the further corrosion of this ancient wonder. Some of the recognizable sculptures include that of Durga and Siva Thripurandhaka . The wall around the central sanctum (Prakara wall) is very thick and there is a small pathway for the devotees to walk around the Sanctum (Pradikshana Patha). When I stood on that narrow stone path, I couldn’t help by wonder how many generations would have passed through this path! How many generations would have passed through this path? Through the narrow pathway, we entered the second shrine that is the small Vishnu shrine. According to the ancient inscriptions, this shrine is known as “Narapathisimha Pallava Vishnugruham”. Vishnu lies in his Ananta Shayana Pose in the dark- rectangular chamber. An ancient inscription also refers this shrine as Pallikondaruliya-Devar (which roughly translates to “God who is in the sleeping posture”). This posture of Vishnu has given the name Jalasayana(Lying in the water) to the shore temple. The sanctum of this inner shrine was so dark. As I looked inside that dark and long sanctum where Vishnu was lying in his meditative sleep in the cosmic ocean, I had a very peculiar feeling. It was a feeling mixed with adoration, awe and a little fear. Without even realizing, I removed my shoes and I couldn’t recover from the strange feeling for some time. May be this place has some connection with me in the previous lives! We entered into the third temple in the complex. It is known as the “Rajasimheswaram” in the ancient scriptures. This temple complex is facing west and it might be the reason that the sculptures inside the sanctum have not suffered corrosion. The Somaskanda panel still looks very fresh and the theme of the panel is same as the first Shiva Shrine. The stone pavement in front of this shrine has inscriptions from the time of Raja Raja Chola. There are two platforms on either side of this main temple which has a row of Nandis seated on it. This area was covered in sand until the beginning of the 20th century. At the entrance of the shrine, we see Balipeeda’s(the stone tables for sacrifice) with inscriptions on them. Towards the north of these shrines there is a Varaha(Boar) statue and a mini-Shiva shrine at a lower ground level which is a recent discovery. The mini shrine is dedicated to lord Shiva. The Varaha is a quite interesting. This Varaha statue, unlike the others featured in the Mahabalipuram cave temples, has its head bend down and is about to take a plunge into the ocean in order to rescue Bhudevi(Goddess Earth). The location of this Varaha is also noteworthy. As this is at a lower ground level, chances are that there would have been water in this place and the statue gets an effect of Varaha about to jump into the sea. There is also a small well like structure next to the mini shrine. It is believed that the miniature shrine and bhu varaha were constructed during the time of Narasimhavarman I while the well was constructed during the time of Narasimhavarman II Inscriptions of Raja Simha can be seen on the base of the mini shrine. Another important artifact of interest is a monolithic lion with female rider and a square niche where Durga is located. The lion represents the vehicle of the Goddess and the female riders are her attendants. On the beach, we see the Varuna’s rock or the Mahishasura mardini rock. 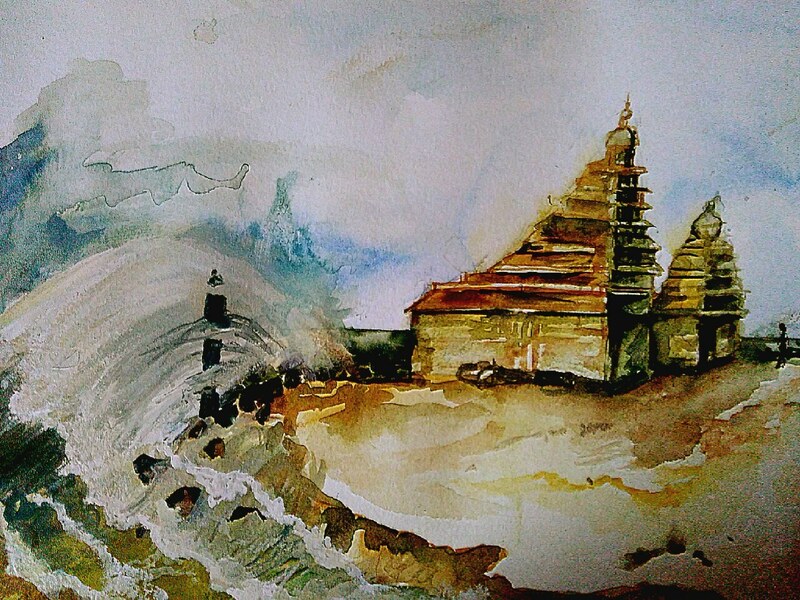 During the Tsunmai in the Bay of Bengal in 2004,<<paste>> After the Tsumai, the coast line was permanently changed and from the water emerged a small Durga temple and lion indicating that there may be much more underneath the sea. 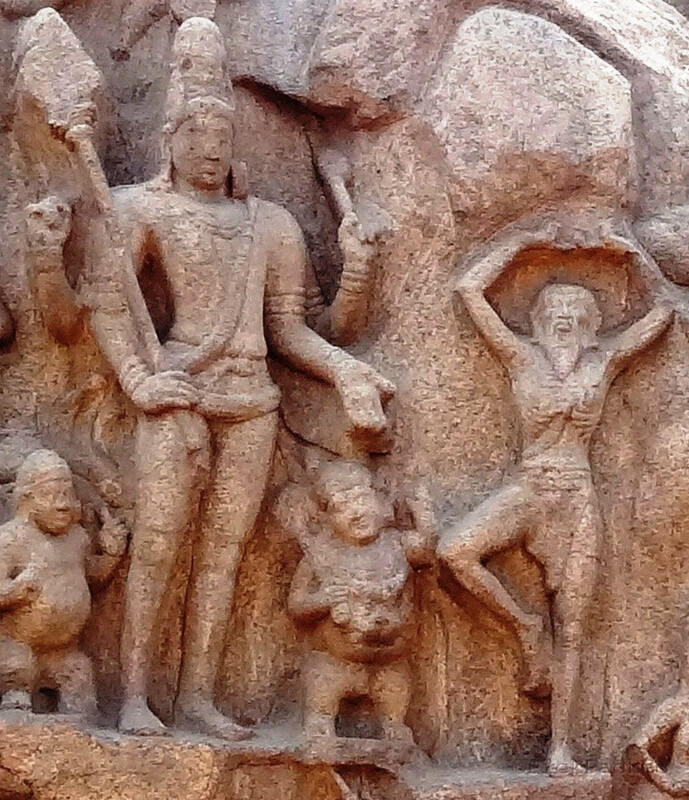 The first thing anyone would notice in Mahabalipuram is the huge open Bas-relief, known as the “Descent of the Ganges”. It is a huge stone canvas - 90 feet wide and 30 feet tall- featuring a very rich theme - Descent of the Holy River Ganges from the heavens and how the life was shaped along its banks. It has become the iconic image of Mahabalipuram in recent years. This monument has also got the name Arjuna’s Penance from the depiction of an ascetic doing the penance to receive the ultimate weapon Pasupatha Astra and lord Shiva has pleased with his penance and granting his wish. Some scholars are also of the opinion that this figure is that of Bhagiratha, doing the penance to bring the holy river Ganges from the heavens. It was to free his ancestors of the Ikshavu dynasty, who were turned into ashes after the sage “Kapila Muni” cursed them for disturbing his meditation. The sage also give an antidote for his curse, that if the ashes are washed in Ganges, the cursed would attain Moksha. So Bhagiratha did a severe penance in Himalayas to please Shiva, who was eventually pleased and agreed to carry Ganga in his hair flocks so that the vigor and size of the river is reduced and earth can carry the river. The prime feature of this monument is however not the penance. It is the central fissure in the rock, depicting the river Ganga flowing from the locks of Shiva to earth and enriching the lives on its banks. Most of the figures in the panel are shown as travelling towards the central fissure, indicating that this is the central theme. On the bottom left side of the Bas relief we see a small temple housing Vishnu statue. There are many figures depicted around this temple. Some are praying, some are teaching and some others are doing the daily activities like taking a bath in the river and fetching water. There are some lions and deer around the temple. The ancient artisans featured lion and the deer together so as to show the Indian philosophy of harmonious living. There are other scenes from the river side. One interseting part is two figures doing yoga postures, scholares interpret them as the first two steps of the "Surya-Namaskara" procedure in yoga. The bottom part of the panel describes a cat doing penance and there are a few mice around him praying. It might suggest the Dandikarna story from the Panchathathra. It talks about a fraud cat sage. There is a herd of elephants, which is almost life size. There is a similar Bas-Relief which is located close to the Decent of Ganges and the theme and theme is also similar. However, this Bas relief is not completed. There are different opinions about the origin of this duplicate Bas Relief. One set of scholars say that the construction of both this and Descent of Ganges started at the same time and two sets of artisians were competing with each other. If this legend is true, then I am sorry to say, the second set of artisians lost with a huge margin to the first! Another set of scholars think that, the second Bas –Relief was an improved or corrected version of the first one. The king might have not been pleased or there might be some sculptural mistake in the first which compelled to carry out a second one. However, due to mysterious reasons, this sculpture was not completed. 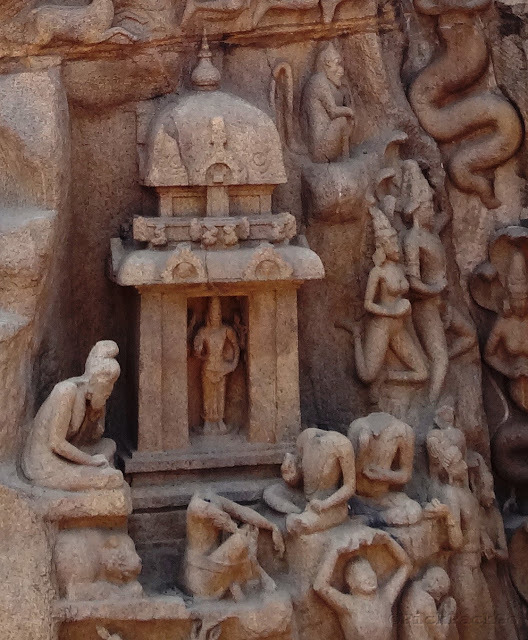 Our journey through Cave temples, Shore temple and Bas –Relief is coming to an end here. However, the attractions of Mahabalipuram doesn’t end here. It will be continued with the Monolithic Rathas in the next part.